Although students who celebrate the Christian faith are given a break from classes to celebrate Easter, students who belong to other religious holidays are given the opportunity to recognize their own holy days. Steve Miller, a pastor of the United Church of Christ (UCC) in Vermillion, also teaches the world religions class at USD. In class, Miller focuses on the diversity of religions and brings representatives from each religion to speak on what it is like to practice their faith at USD and in South Dakota. In his twelve years teaching at USD, religious diversity has expanded, Miller said. Anita Shrestha, an international student from Nepal and a graphic design graduate student, is president of the International Club and belongs to the Hindu religion. Although she has not heard much conversation about whether or not the university should acknowledge other religious holidays on their calendar, she said she thinks there should be more. There are no university or South Dakota Board of Regents (SDBOR) policies regarding how students celebrate other holidays, but professors can work with students on a case-to-case basis to excuse absences. 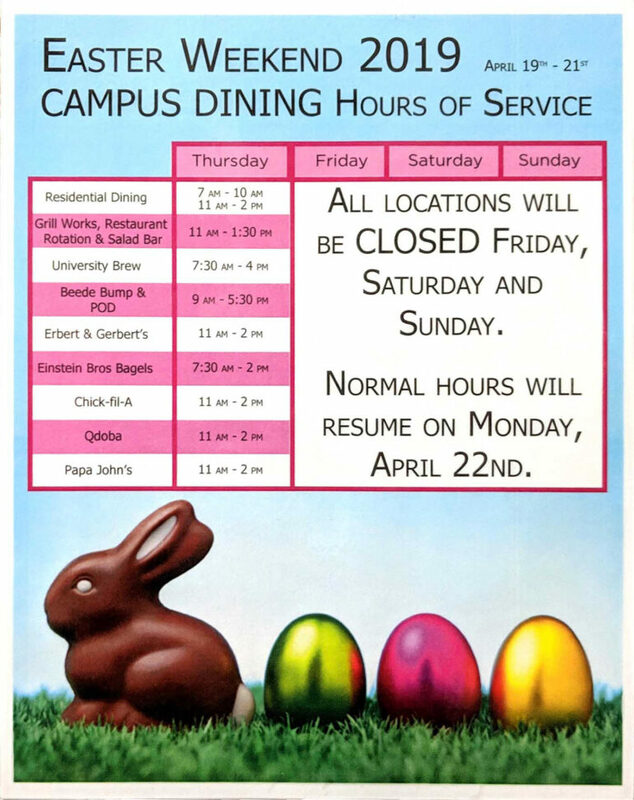 Kim Grieve, Dean of Students, said the Easter Break has always been a part of the SDBOR calendar, although she does not know exactly why. Grieve said students can work through the Dean of Students office to work with their professors on their absence. Miller said faculty are understanding of the diversity of religion at USD and is accommodating to missing class to celebrate religious holidays. Grieve said some students choose not to miss class to celebrate, but instead celebrate on a weekend. Miller said this is because of the different ways people can identify with their faith. Maria Vyshkovskaia, a junior finance major, is an international student from Russia. She said although her faith celebrates Christmas during a time where there is class, it is not crucial for her to miss class to celebrate. “We have a different calendar. We celebrate, for example, Christmas on the 7th of January, which was the first day of school,” she said. Shrestha said USD professors are very supportive of celebrating religious holidays. Vyshkovskaia said celebrating holidays can be difficult since there is no Orthodox Church in Vermillion. Miller said students who practice other religions other than what the UCC teaches are still welcome to join in on the Easter services. The UCC often allows members of other faiths to use their space for religious ceremonies, such as funerals, Miller said. The USD community and the ability to celebrate religious festivals helps her feel more at home, which Shrestha said is something she is grateful for.